Hazardous materials can include toxic chemicals, infectious substances, biohazardous waste, and any materials that are explosive, corrosive, flammable, or radioactive. Hazardous material releases can occur wherever hazardous materials are manufactured, used, stored, or transported. Such releases can occur along transportation routes or at fixed-site facilities. Hazardous material releases can contaminate air, water, and soils possibly resulting in death and/or injuries. Dispersion can take place rapidly when transported by water and wind. While often accidental, releases can occur as a result of human carelessness, intentional acts, or natural hazards. When caused by natural hazards, these incidents are known as secondary events. Releases can affect nearby populations and contaminate critical or sensitive environmental areas. Transportation of hazardous materials on highways involves tanker trucks or trailers, which are responsible for the greatest number of hazardous material release incidents (FEMA, 1997). There are over 120,000 miles of highway in the Commonwealth and many of those are used to transport hazardous materials (PennDOT, 2016). These roads also cross rivers and streams at many points and have the potential to pollute surface water and groundwater that serve as domestic water supplies for parts of the Commonwealth. Between 2008 and 2017, there were over 7,500 highway-related incidents resulting in 65 injuries, one fatalities, and nearly $19 million in damages. Potential also exists for hazardous material releases to occur along rail lines as collisions and derailments of train cars can result in large spills. Several railroad accidents have occurred in Pennsylvania involving hazardous materials (NTSB, 2018). Between 2008 and 2017, there were 245 rail-related incidents resulting in five injuries, no fatalities, and over $13 million in damages. Pennsylvania has 9,935 miles of active natural gas transmission pipelines and 3,089 miles of active liquid pipelines. Of the liquid pipeline mileage, approximately 1,1,48 miles carry highly volatile liquids. Fixed-site facilities that use, manufacture, or store hazardous materials in Pennsylvania pose significant risk to public health and the environment and must comply with Title III of the federal Superfund Amendments and Reauthorization Act (SARA). 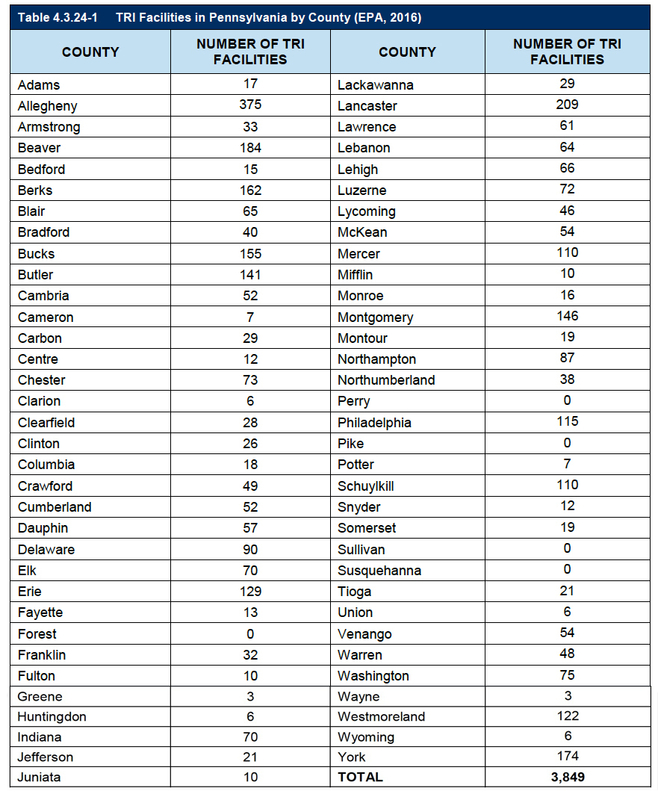 In 2011, there were 3,298 SARA Title III facilities in Pennsylvania. These facilities must notify the public through their county’s emergency dispatch center and PEMA if an accidental release of a hazardous substance meets or exceeds a designated reportable quantity and affects or has the potential to affect persons and/or the environment outside the facility. 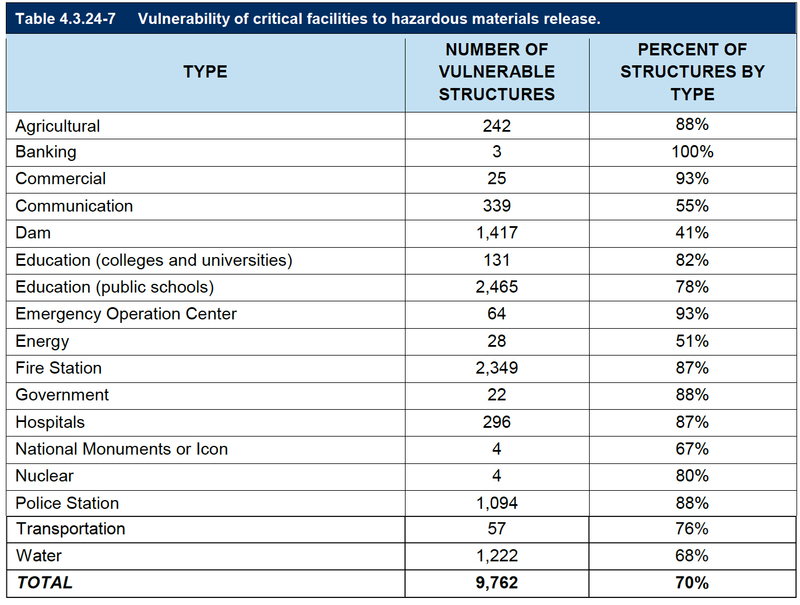 EPA also tracks key information about chemicals handled by industrial facilities through its Toxic Release Inventory (TRI) database and as of 2016, there were 3,849 facilities in Pennsylvania (EPA, 2016).